German historian Martin Bayer explains how the events of 1917 were decisive in determining the outcome of the First World War, as well as the course of twentieth-century history. Detail from Fritz Fuhrken's “Kanonenschlag” (cannon beat), courtesy of Fritz Fuhrken estate. By 1917, the First World War was locked in a deadly stalemate, as the offensives of 1916 did not lead to victory for any warring side. Germany was still fighting a multi-front war – on the Western and Eastern Fronts, in the Alps and even in the Middle East. The main effort was put into the Western Front, against millions of soldiers from the United Kingdom and France, their colonies and dominions such as Australia, India and New Zealand. The war on the Eastern Front dragged on, including support for the Austro-Hungarian forces. In the previous year, the high hopes of the German Supreme Army Command for a breakthrough at Verdun had led to a futile bloodbath for both the French and Germans. The Germans had gained some 15km of land at the cost of more than 500,000 fatalities on both sides. On the other hand, the Battle of the Somme later in 1916 had not succeeded as intended by the Allies, but had instead exacted hundreds of thousands of casualties. Beyond the stalemate on the battlefields, the British continued to command the seas. The Battle of Jutland, also in 1916, might have been regarded as tactical victory by the Germans who had caused more damage with fewer vessels. Ultimately, however, the German High Seas Fleet, a cornerstone of German Emperor Wilhelm II’s pride and prowess, saw no further action during the war. Fritz Erler’s stunning portrayal of a German frontline soldier shows various attributes of industrialised combat, including barbed wire, the iconographic steel helmet (issued since 1916), a gas mask and stick grenades. 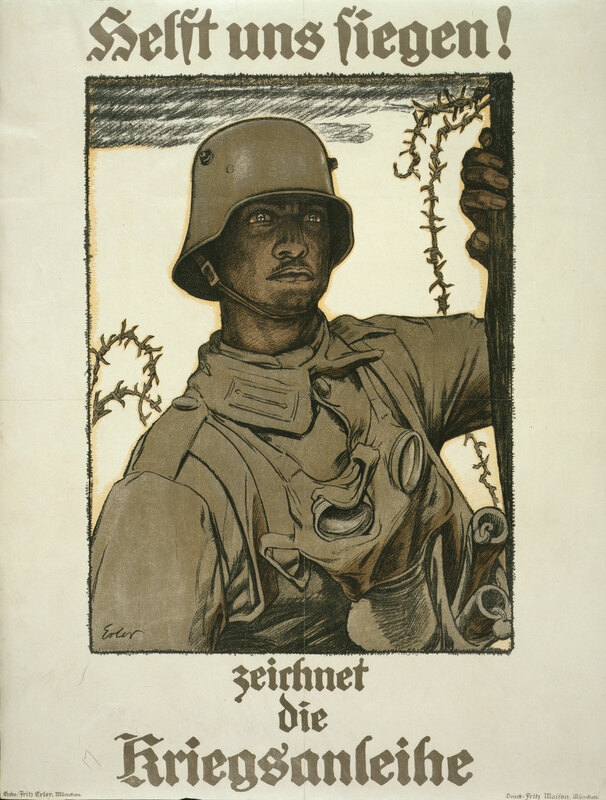 Fritz Erler (1868-1940), “Helft uns siegen!” (Help Us To Win; advertising poster for the 6th war bond), 1917, lithograph, 58 x 44 cm, Library of Congress, Prints & Photographs Division, WWI Posters, LC-USZC4-11292. The Allied naval blockade proved to be highly successful, as Germany was tremendously dependant on importing raw materials and food. By late 1916, the supply situation for the civilian population – especially in the cities – had become alarmingly problematic. Food stamps for bread, eggs, butter and many other goods had already been issued since early 1915. Ersatz (substitute) was a common word: shoes made of cardboard instead of leather, bread diluted with sawdust, and many other daily needs consisting of rather unusual and often shoddy material. The protracted war, the potato blight of autumn 1916 and the bitter winter of 1916/17 led to a supply crisis that became known as Steckrübenwinter (turnip winter), as this unloved vegetable – originally cultivated as pig feed – became the main (and often only) food. Famine became widespread, as were protests, food riots and strikes. By the time the Treaty of Versailles was signed in mid-1919, an estimated 750,000 German civilians had died as a result of the famine caused by the naval blockade. The Central Powers’ military leadership knew that a similar winter could not be sustained, and pressed for decisive action. A breakthrough on the Western Front was regarded as unlikely, at least while the German forces were divided between various theatres of war. As the High Seas Fleet was obviously incapable of lifting the naval blockade, submarines became the centre of attention. Hunger became a frequent acquaintance to many people in Germany, and not just in the severe winter of 1916/17. In the later stages of war, countless weakened people lost their lives to the Spanish flu, including the artist of this piece, Hugo Krayn. The majority of Krayn’s works were destroyed during the Second World War. 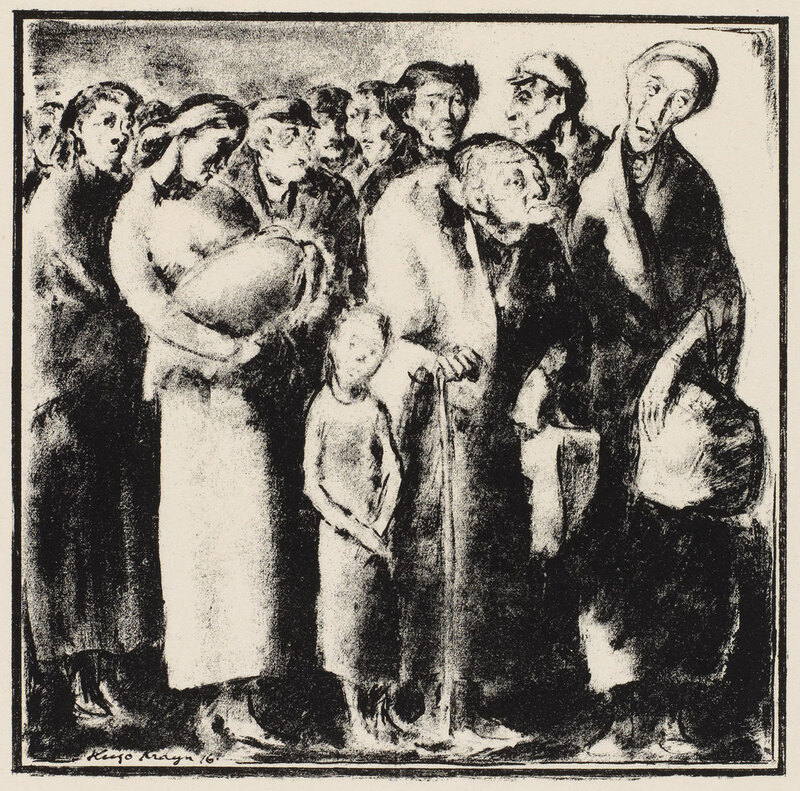 “Hunger”, 1916, lithograph, 21.5 x 21.8 cm, collection of Gerhard Schneider. In August 1914, Germany had just 28 submarines (of which only 10 were fully operational), compared to 78 operated by Britain and 55 by France. At that stage, submarines were regarded more as having supporting roles, such as reconnaissance and the protection of coasts or major vessels. But in the early morning of 22 September 1914, U-9 spotted three armoured cruisers in the North Sea. Within less than two hours, HMS Aboukir, HMS Cressy and HMS Hogue were sunk. This chance encounter changed the former limited perception of submarines, and sinking enemy (and neutral) vessels by U-boats became the main method to counter the Allied blockade. On 1 February 1917, the unrestricted submarine campaign was reinstated again – after a year-and-a-half hiatus following the sinking of RMS Lusitania – as it was believed to be the only chance to break the deadlock of both the naval blockade and the carnage at the Western Front. The United States’ declaration of war followed on 6 April, partly in response to the renewed submarine campaign. This was considered as the lesser evil by the German Supreme Army Command, whose strategy was based on the war being won before the Americans could send considerable numbers of troops to Europe. It proved to be another crucial error of judgement that ultimately became fatal. 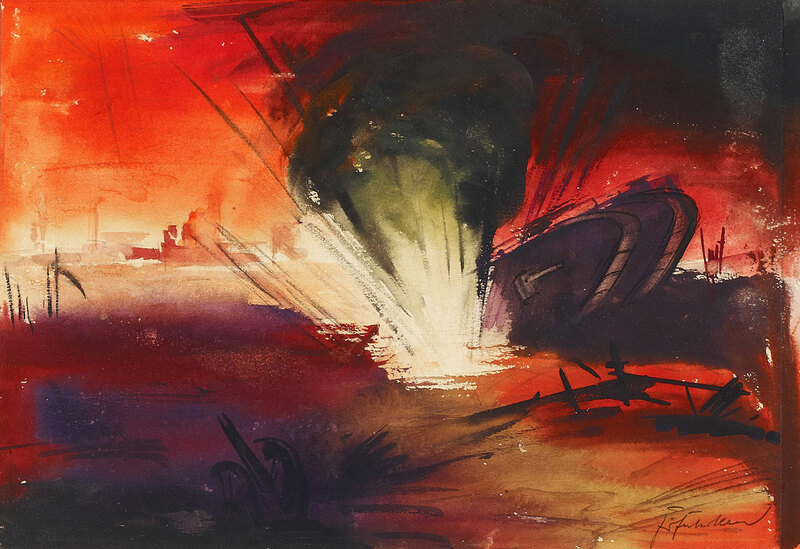 The colours of fire and smoke dominate Fritz Fuhrken’s expressionist portrayal of fighting an Allied tank. While not a war-winning weapon, the advent of the tank marked an important development in military technology. Fuhrken was lucky to survive WWI as a British prisoner of war. Fritz Fuhrken (1894-1943), “Kanonenschlag” (cannon beat), around 1918, watercolour, 16 x 23 cm, Fritz Fuhrken estate. Nevertheless, by autumn 1917, the tide seemed to have turned for the Central Powers. Due to massive German support, the 12th Isonzo Battle in late October marked an enormous breakthrough for Austro-Hungarian forces. After years of bloody battles in difficult alpine terrain following Italy’s entry into the war in 1915, the Italian army was driven back to the Piave River and close to collapse; only massive Franco-British backing prevented an Italian surrender. Even more significant was the Bolshevik October Revolution, which accelerated the dissolution of the Eastern Front. Peace talks were made, and on 9 February 1918, a separate “bread peace” with the new state of Ukraine was signed. With the Treaty of Brest-Litovsk, signed on 3 March, Russia was no longer a belligerent of the First World War. Germany could occupy vast areas of Russia, and – even more importantly – most of its troops on the Eastern Front could be transferred to the Western Front. Heavy fighting continued throughout 1917, not just on the Western Front. Otto Fischer-Trachau’s works condense both chaos and massive destruction experienced by the soldiers. 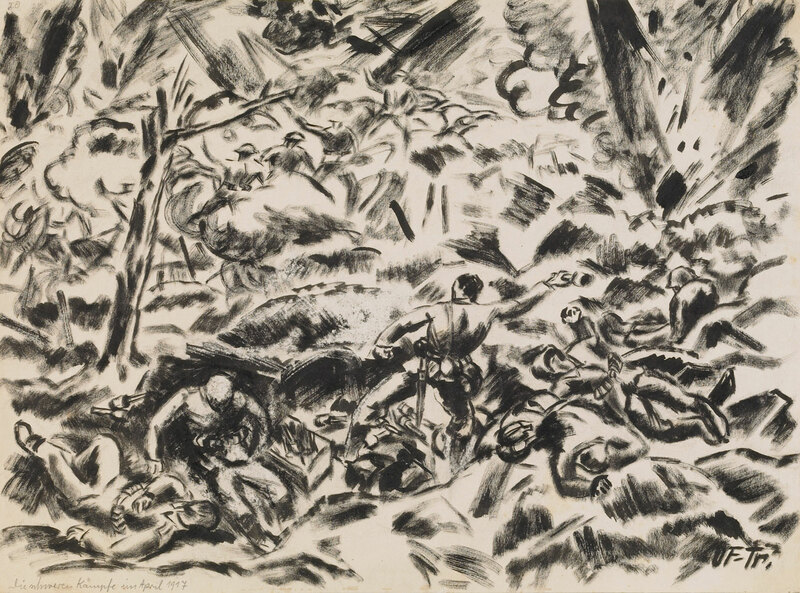 Fischer-Trachau (1878-1958), “Die schweren Kämpfe im April 1917” (The Heavy Fights in April 1917), 1917, tempera, 36.3 x 49 cm, collection of Gerhard Schneider. There, a new weapon system came to emergence. While the first British tanks had already been used during the Battle of the Somme in 1916, it took the Battle of Cambrai in November 1917 to finally deploy them in the way that early tank strategists had always demanded – in numbers, making a massive push. At this stage, even the Germans saw the possibilities of the new weapon. Until that point, Germany had not developed tanks, as they were mostly considered a waste of scarce resources while being mechanically fragile and comparably easy to be countered with field artillery, concentrated charges of hand grenades, “K” type ammunition and a newly developed anti-tank rifle. Thus, in late 1917, despite the hardships of more than three years of costly warfare, a highly precarious supply situation where even ersatz material ran out, and not least the United States’ declaration of war, the Central Powers’ hopes for a victorious end of the Great War had risen once again. With numerous divisions redeployed from the East, it was hoped that the Spring Offensive of 1918 would bring victory in the West. Andreas Gering suffered from speech disorder after being buried alive during a bombardment from which he was retrieved seriously injured. 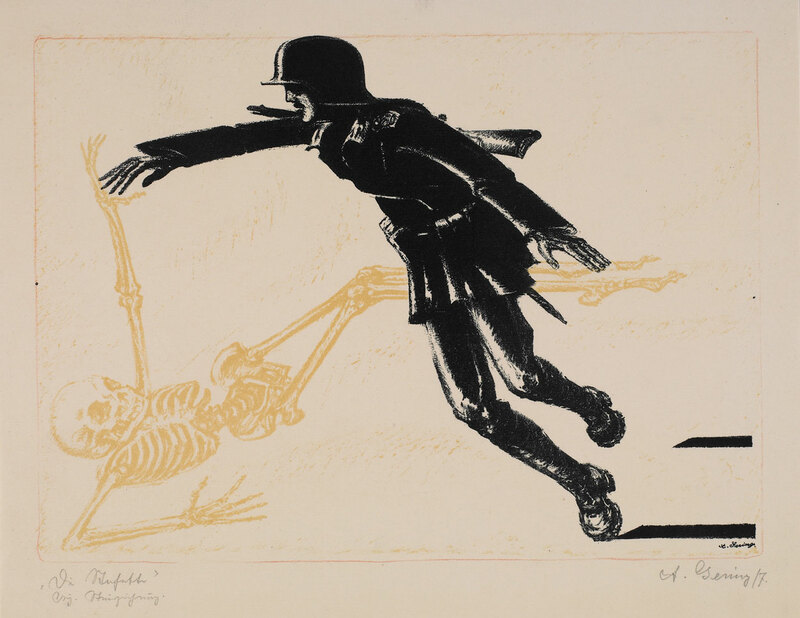 He subsequently worked often about death, depicting its proximity in a soldier’s life. Andreas Gering (1892-1957), “Die Stafette” (The Relay), 1917, colour lithograph, 23.7 x 32.5 cm, collection of Gerhard Schneider. Indeed, Operation Michael in late March 1918 brought the German Army territorial gains of up to 60km, the largest since 1914. However, both men and matériel were quickly exhausted. As with earlier battles, the conquests could not be exploited, and fresh US forces replenished the Allied side. It took until November for the war to come to an end, and countless more men had to perish. The reintroduction of unrestricted submarine warfare in February 1917 had sealed the fate of the German Empire. Two days before armistice, Wilhelm II abdicated and the German Republic, the first German democracy, was proclaimed by Philipp Scheidemann. One hundred years after the events, bodies such as the European Union are in place, and old enmities have been overcome. Today, democracy, freedom and friendship between former foes are often taken for granted, but in fact, they are invaluable assets that need to be fostered and defended.